WT Wealth Management believed in and utilized a variety of low-volatility, dividend-paying Exchange Traded Funds (ETFs) over the last several years. The low-growth, low-inflation, low-interest-rate environment made those investments attractive, functional, and, frankly, "where the returns were." Post-election market shifts have not diminished the case for a strategic allocation to low-volatility, high-dividend stocks, in our opinion. But, what a difference a day makes. Donald Trump's Nov. 8 victory set in motion a rapid change in the landscape for income investors: 10-year US Treasury yields rose sharply, rising nearly a full percentage point to a post election high of 2.632% by mid-December 2016. Catalysts for this sudden spurt included expectations for faster growth and higher inflation, driven by potential policy changes in Washington, D.C. US stock prices also soared dramatically since Election Day, putting pressure on the effective yields of dividend-payers in the process. What could these shifts mean for yield-conscious investors whose investment managers have turned to dividend stocks for income in recent years, favoring those with lower volatility? Does that approach still make sense? The answer is, yes! Investors' need for reliable sources of income is still acute, and yield is still hard to come by without taking on fixed-income risk. Our huge rally in stocks, seemingly out of nowhere, emphasizes that markets can change quickly-both for the worse as well as better. The global economy and financial markets have been changing rapidly since the beginning of 2016, and that trend seems to be continuing in 2017. Upcoming elections in Germany, France, and elsewhere in Europe signal potentially large shifts in policy. New political and financial realities are now complicating second-guessing changes in financial markets; most recently, voter decisions that were expected to be negative for UK and US stocks (Brexit, US election) had the opposite effect. The potential uncertainty surrounding these changes is a reminder than one can't take any rally for granted and that a defensive, low-volatility approach to equity income has a strategic place in a diversified portfolio. 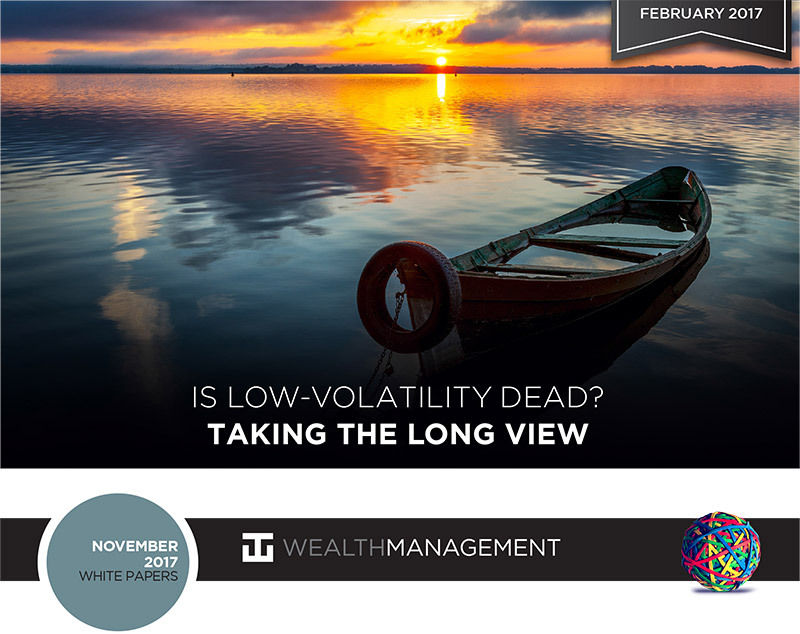 Maintaining an allocation to low-volatility stocks is thus a prudent move, regardless of conditions at any particular point in time. The chart below highlights some popular yield comparisons on commonly held investments. With rates seemingly on the rise, do equity dividends still look as attractive? Yes-and maybe even more so than ever. Though yields on US bonds shot up in the aftermath of the election, yields have pulled back after their post election run-up. As of January 31, 2017, 5-, 10-, and 30-year treasury bonds were yielding 1.88%, 2.43% and 3.04%, respectively. However, if the House passes any of Trump's campaign-trail promises, we could see explosive growth and a quicker Fed path to increased interest rates. Many economists see as many as three or four rate increases this coming year. At WT Wealth Management, we would be more skeptical than that. After nearly a decade-long hiatus from raising rates amid the financial crisis and subsequent fiscal meltdown, the last two years have delivered only two rate hikes. We also predict two of them in 2017-in June, and sometime in the fall-based on jobs, inflation and gross domestic product (GDP) numbers. It's easy to forget, however, that the anticipated Trump policy changes that have pushed up bond yields between the election and the Dec. 14 rate hike have yet to pass the Washington legislative gauntlet. However, the dramatic move to a peak yield of 2.632% for 10-year Treasury yields may still feel low-and historically they are, for they haven't been above the 4% mark in almost a decade, considering that the 50-year average is over 5%. How does this affect investors seeking income through bonds? The answer: a lot. If an investor holds the bond to maturity, it is a "non-issue." But any time in-between, investors can suffer from "statement shock" as their "safe" bonds lose 5%, 6%, or even 10% of their value in a short period of time. Keep in mind that every 1% moves higher for the 10-year Treasury yield can result in nearly a 10% move lower on the price of the actual bond. Bonds are not riskless-in fact, they carry a tremendous amount of risk when you are in a low-rate environment and on the cusp of a sharp economic recovery. A move from the mid 2.5% range on the 10-year to 4% would be devastating on bond portfolios. With that in mind, at 3.60%, the current yield of the Dow Jones Select Dividend Index-which focuses on stocks with the highest dividend yields-is still well above the recent peak in 10-year Treasury yields of 2.632%. We at WT Wealth Management still believe that high-quality dividend-payers are an excellent way to invest and eliminate the risk of a heavily laden bond portfolio, as described above. So, given the very real prospect of range-bound GDP growth, equity dividends in general arguably remain an attractive place to satisfy income needs-especially when one moves toward higher-quality dividend payers. After the recent run-up, it's prudent to ask whether all gains will persist. The P/E ratio of the S&P 500 is 20.4x as of January 31, 2017-a level unseen since the run-up to the Great Recession in 2008-9. With the S&P 500 and the Dow Jones Industrial Average (DJIA) at all-time highs, and the NASDAQ Composite above its 2000 Tech-Bubble high, some pullback would not be impossible but, in fact, is inevitable. Since the CBOE SPX Volatility Index (VIX) currently stands at 12.25 as of January 31, 2016, near its 2006 low of 11.27 and its 20-year low of 9.89 on January 24, 2007, at the beginning of the run-up to the Global Financial Crisis, there could plausibly be more room for downside than for upside. In a year in which investors have come to expect the unexpected, downside capture-the degree to which an investment strategy outperforms its benchmark during market declines-has become a key concern for the risk-averse. It's also something the investment professionals look at daily. We screen hundreds of investments to find compelling "upside" capture stories but implement only those with exceptional "downside" capture results. In our opinion, a focus on profitable companies that exhibit low price and earning volatility is a reasonable way to participate in equity-market upside while managing for clearly inevitable downside moves. Additionally, a focus on higher-yielding names with solid earnings can lead to more attractive valuations, and potentially smaller downdrafts during pullbacks, in what many consider to be an overbought high-dividend market sector. 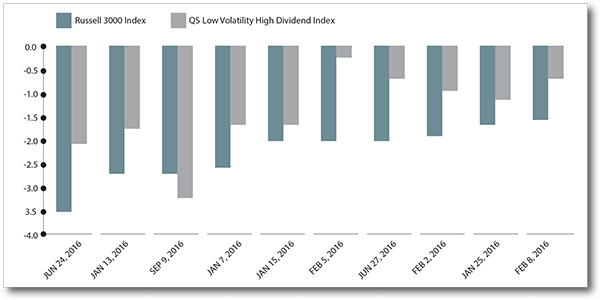 One example of this effect: in 2016, the S&P 500 Low Volatility High Dividend Index showed noticeably better (i.e., smaller) downside capture during the vast majority of market downdrafts during the year. Despite the recent outpouring of optimism, the year ahead could well be marked by uncertainty as the new Trump regime in Washington moves forward with new policy prescriptions. Given the unprecedented changes ahead and the current state of financial markets, it still makes sense to prepare for stormy weather while the skies are clear, rather than waiting for the waves to rise-by maintaining a prudent allocation to low-volatility strategies as part of a broadly diversified portfolio. WT Wealth Management is looking ahead while not forgetting the past. We've made considerable changes to client accounts in the past six weeks but continue to put prudent capital protection techniques ahead of "full steam ahead." We are very optimistic and quite bullish, as the recent events in the equity markets have rewarded our clients handsomely since Election Day. The moral of the story is to make ground when the seas are calm and the wind is at your back, but to keep an eye on the horizon for those short, sudden storms that can rock your boat and rattle your confidence. WT Wealth Management is a manager of Separately Managed Accounts (SMA). Past performance is no indication of future performance. With SMA's, performance can vary widely from investor to investor as each portfolio is individually constructed and allocation weightings are determined based on economic and market conditions the day the funds are invested. In a SMA you own individual ETFs and as managers we have the freedom and flexibility to tailor the portfolio to address your personal risk tolerance and investment objectives - thus making your account “separate” and distinct from all others we potentially managed.